Members of the NYBBS Reserve Band's trombone section in action. 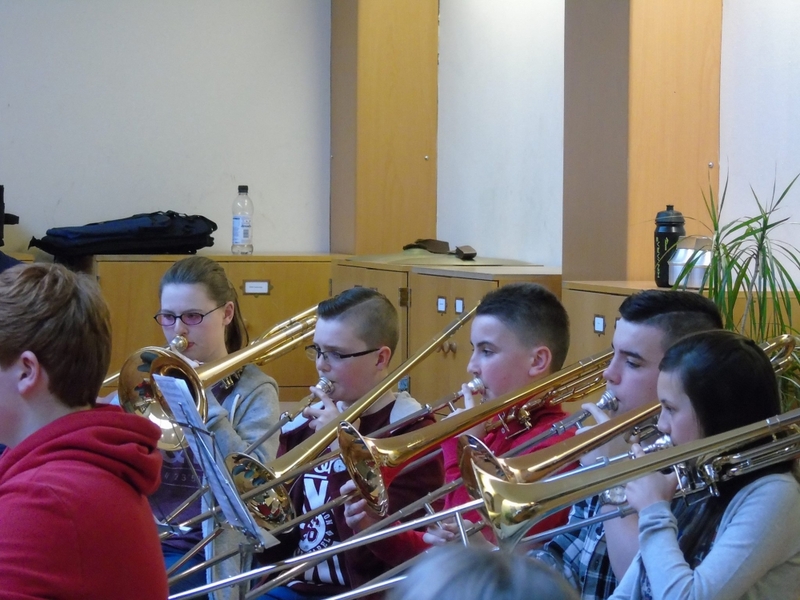 SUPPORTERS of the National Youth Brass Bands of Scotland (NYBBS) have gathered in Perthshire to hear the bands performing at their Easter residential course. The event, which was supported by Creative Scotland, saw the senior and reserve bands perform for a delighted audience at Strathallan School. Conductors Russell Gray and Richard Evans worked with the senior band while John Boax and Gordon Evans MBE helped unlock the potential of the NYBBS Reserve Band. Senior NYBBS members performed repertoire they are rehearsing for a Malcolm Arnold CD recording including his Little Suite for Brass, Fantasy for Brass and the Padstow Lifeboat. Musical Director Russell Gray also held a sight-reading session. The NYBBS Reserve Band performed Cyclone and featured soprano cornet player Hannah Oman in Somewhere in Time. Members also played the first two movements of The Canadian Folk Song Suite and finished with the 1994 European youth contest set work, Adventures in Brass. Carrie Boax, SBBA president, reflected: “Our open rehearsal was a wonderful opportunity to engage with parents and wider supporters of the National Youth Brass Band of Scotland. Other events at the open rehearsal saw John Boax, SBBA education officer, address those present to discuss the senior NYBBS’ upcoming trip to Norway. NYBBS tutors, many of whom spent their formative years in the organisation, reflected on the effect NYBBS had on their musical and social development. The event comes as the Easter course continues to progress, with the senior NYBBS putting the finishing touches to its Malcolm Arnold CD recording. The NYBBS Easter course runs from April 5 – 8, 2016.